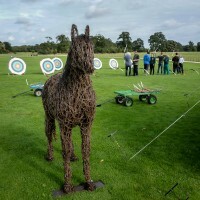 The Cornucopia festival took place over the weekend of 24th & 25th September at Burton Constable. Alongside the fantastic music and dance acts, our archers held have-a-go sessions for members of the public to have a taste of archery. Our thanks go to our members for their support throughout the weekend, and special thanks to all the festival-goers who picked up a bow – please visit our Contact Us page if you would like details of our beginner courses in 2017. Further photos are uploaded to our gallery page.